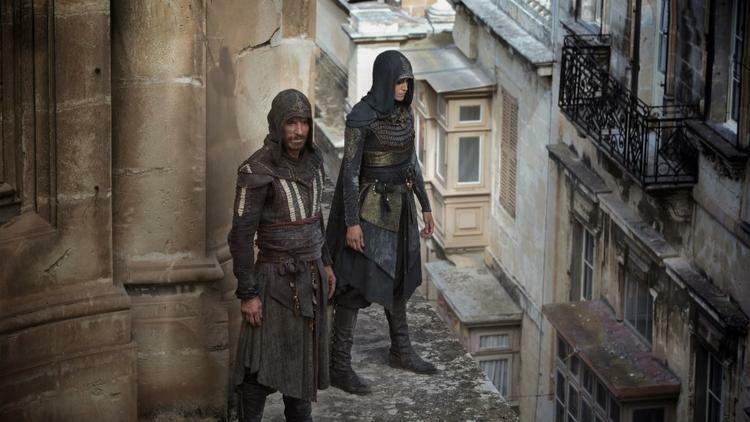 With the first trailer now poised to debut tomorrow, May 11, Ubisoft and New Regency have offered up another pair of images for Justin Kurzel’s live-action Assassin’s Creed movie, placing Michael Fassbender in the dual role of Callum Lynch/Aguilar. Arriving by way of The Los Angeles Times, both stills (seen in the gallery above, alongside two previously released ones) carry on the momentum from yesterday’s teasers in that they feature Fassbender’s two heroes separated by time. Clad in period garb, one features an action shot of Fassbender’s Aguilar standing shoulder to shoulder with Ariane Labed’s fellow sleuth. Perched on a rooftop overlooking 15th century Spain, there’s no doubting that our two clandestine heroes are tracking the deadly Knights Templar. It’s that malevolent organization that serves as the crux of Assassin’s Creed’s sprawling story, leading our present-day protagonist Callum Lynch to seek out the genetic memories of his ancestors in a bid to relive the past. Much of that mission is funnelled through the Animus, a piece of technology that allows Fassbender’s character to essentially travel back in time and experience different epochs. Orchestrating that time-hopping adventure is Macbeth director Justin Kurzel, reteaming with both Fassbender and Marion Cotillard. Rounding out the ensemble for Ubisoft’s ambitious tentpole are Labed, Michael K. Williams, Jeremy Irons and Brendan Gleeson. Legendary’s Warcraft movie may have the chance to break the longstanding video game-to-movie curse next month, but it won’t be long before Ubisoft’s Assassin’s Creed scurries into theaters on December 21. In the meantime, check back to We Got This Covered tomorrow, May 11, when we’ll have a full breakdown of the film’s maiden trailer.